I’m in a bit of a hurry today. Recently, there was a Cubic variant from Bastien having Consecutive clues but no converse. And then, there was the Skyscrapers Kropki on Deception that abandoned the converse part of the rules. I like this for its simplicity and the fact that it makes things easier aesthetically. Since I’m in a hurry, today seemed to be the perfect day to try and see just how simple it makes things to construct a Sudoku without the converse consecutive rules. I also like how Outside rules can work with it. 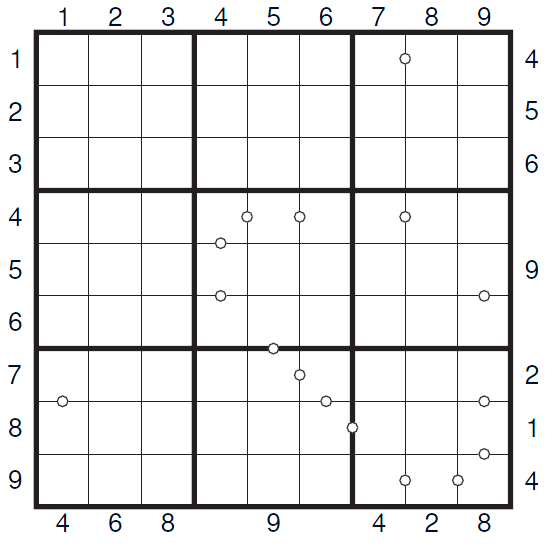 Rules – Follow regular Sudoku rules. Additionally, the digit outside must be placed in one of the first 3 cells in that direction. Also, if there is a dot in between 2 cells, those 2 cells must contain consecutive numbers. All dots are not given, so there is no converse rule. This variant is quite tricky in general, but I’ve tried to make at least some of it relatively obvious. Either way, I like the combination, and I like how it turned out. 1. Outside clues – The digit must be placed in one of the first 3 cells in that direction. 2. Skyscraper clues – Taking 1-9 as skyscrapers of increasing heights, 9 being the biggest, the clue shows how many skyscrapers can be seen from that direction. Bigger skyscrapers block smaller ones.